By Michael Thomét. Played to completion (sort of) with Firefox. The interactive nature of games means, on occasion, players can have such wildly different experiences they come across as different games. 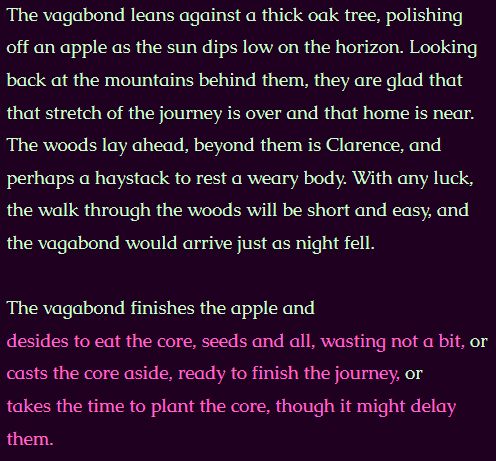 With A Figure Met in a Shaded Wood, I am guessing for some the story went like this: a vagabond was walking to a town through a wood, made some minor moral choices on the way, met a stranger who told his fortune via tarot cards and … disappeared. These players felt satisfied with the mini-fable, and moved on to the next competition entry. I (and likely many others) decided to restart and see if something different would happen. The same choices were presented, but the tarot cards ended up being exactly the same as before, and things got very, very, weird. Yes, it’s breaking the fourth wall here. 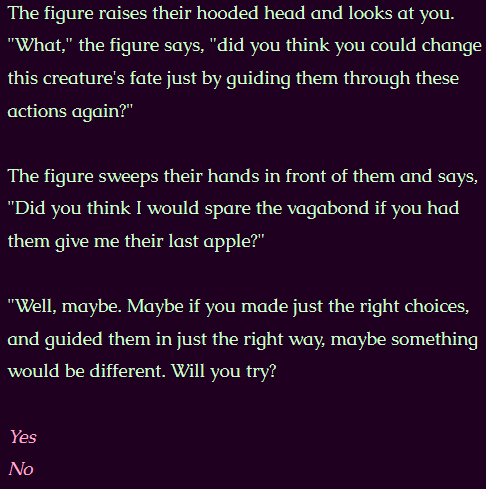 The figure is talking to you and giving a challenge: can you somehow make choices so the story does not end in oblivion? Suddenly the game is something of a puzzle-on-repeat, like Rematch or this competition’s Duel. The repeated choices became mechanical and, in a strange way only conveyable by interactive systems, conveyed the meaningless of choice; I started to click rapidly without even looking at what text was presented. I was starting to think that the entire setup was a bluff, and in fact there is no way to save the vagabond (“Look, this vagabond is gone from this world. They left it before you even came along.”) when certain choices started to be underlined. After many tries of avoiding or intentional using underlined choices I never was able to get any farther. If Shaded Wood is meant to be a puzzle game rather than an ambiguous philosophical statement, it needs more feedback on failed attempts to win. UPDATE: Finally broke down and checked the source code. There is only the one ending. 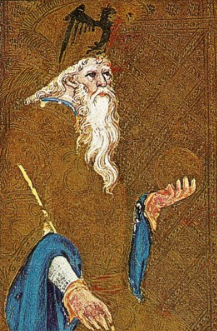 Profile of The Emperor card. I never actually saw this one in the game, but I like it most. I’m still not convinced — because of the underlining — that there is no solution. Unless the author was making a literal trolling attempt here. Checked source code. Trolling. Nevermind. It might be trolling. But I gave it a more generous interpretation as a meta-commentary on the agency of the player to ignore an encounter by quitting the game vs the lack of agency of the PC, who is doomed to the encounter as long as the player keeps repeating. But probably I’m overthinking this. It’s probably just trolling.